Despite the Obama administration’s moratorium on new offshore drilling permits for the next six months, BP project “Liberty” moves forward in the Beaufort Sea off the coast of Alaska. An artificial island, Liberty qualifies as an onshore project and is, therefore, not included in the moratorium. Still, BP will use a potentially risky method of drilling called extended reach. 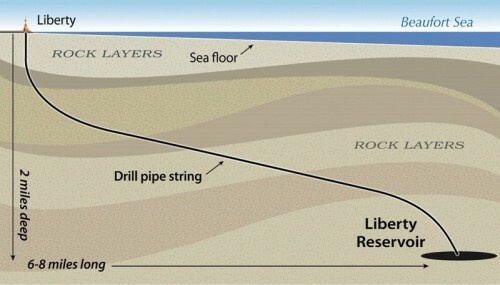 After drilling two miles below the island, engineers will drill sideways a minimum of six miles to reach the reservoir. Read Tim Dickinson’s June 22 summary in Rolling Stone. Greenlanders can hunt humpback whales after a 25-year ban Reuters reports. Eighty-eight countries represented at the International Whaling Commission (IWC) meeting in Morocco Friday voted in support of the Greenland request. Greenland’s Inuit are currently allowed a total annual catch of 19 fin whales, 2 bowhead whales, and 12 minke whales to support a subsistence lifestyle in a country with few exports. The humpback quota will total 9 whales. Whaling opponents criticize the decision, saying that Greenlanders reap financial rewards from whaling that extend far beyond local consumption due to the sale (and hefty markup) of whale meat to supermarkets and hotels. Charles Wohlforth, who reported on the Exxon Valdez spill in Prince William Sound, weighs in on the Gulf of Mexico disaster for Andy Revkin’s Dot Earth blog. Read what Wohlforth had to say about the similarities and differences in spill response, political climate, community fears, and hopes. Science reporter Andrew Pollack writes in The New York Times that salmon may be the first genetically engineered animal approved by the Food and Drug Administration for American consumption. The altered fish, which may grow twice as quickly as natural salmon, await F.D.A. analyses which will determine whether the fish are safe to eat and whether they pose a threat to the environment. After a late surge in sea-ice growth in April, on average more than 26,000 square miles of sea ice disappeared every day during the month of May, a bump of more than 50% above the average for this time of year, reports the National Snow and Ice Data Center. This is the highest rate of sea-ice loss seen since satellite observations began in 1979. It’s too early to tell if 2010’s September minimum will break the 2007 record for lowest sea-ice extent. Watch the NSDIC Web site for monthly updates.